Luxurious heavyweight cufflinks in silver with organic textured design finished and lush yellow gold plating. We thought you would like to know has been eyeing up our 22k Yellow Gold Plated Silver Flowing Curves Cufflinks for some time now and has requested we bring it your attention. What's your question about 22k Yellow Gold Plated Silver Flowing Curves Cufflinks? These Flowing Curves cufflinks feature an eye catching combination of silver and 22k yellow gold in both a polished and textured metal. A beautiful pair of cufflinks, suitable for every occasion. 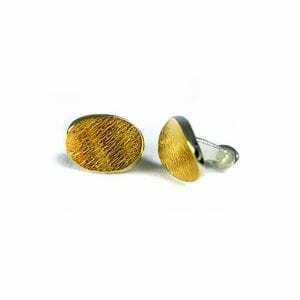 Cufflink Dimensions: 21mm x 15 mm.